Whether you want to stand out in the interview process, add punch to a presentation, or make a compelling case for a new initiative, Let the Story Do the Work shows you how to mine your experience for simple narratives that convey who you are, what you want to achieve, and why others should care. By adapting proven story structures and conventions, you can create compelling presentations that make lasting impressions. Nothing resonates and persuades as powerfully as a story. To connect with audiences by determining their points of view and speaking to their concerns. How to cut through data to explain what the numbers mean and why people should care. To blend simple visuals to amplify a presentation's persuasiveness. 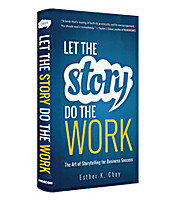 How to tell your story in a way that builds credibility and forges relationships.